Click the image to see it in full scale. 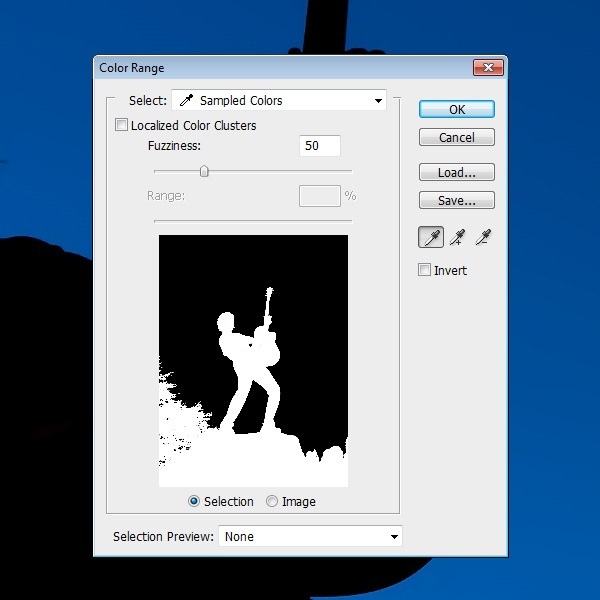 Start by downloading the Guitar Silhouette 3 image and opening it in Photoshop. Next, go to Select > Color Range. 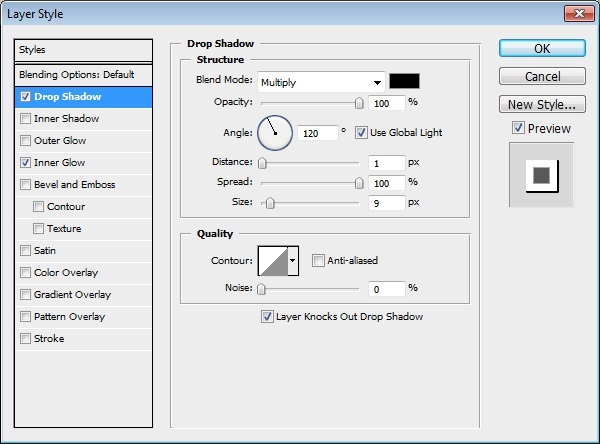 Click on the black part on the guitar player with the Color Range’s Eyedropper Tool to set the sampled color, change the Fuzziness option to 50 and then press OK to create the selection. If done right, this should load a selection around the guitar player. 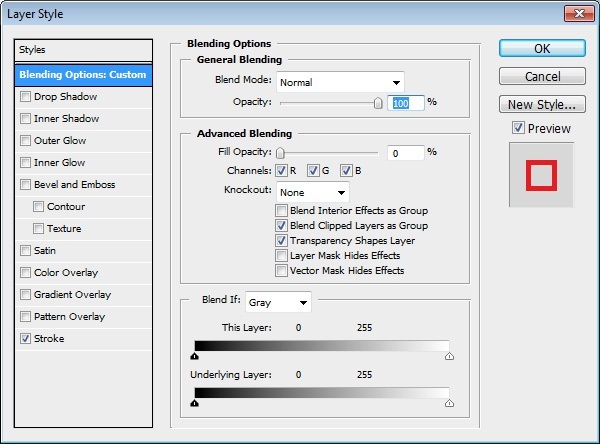 To extract the black area we selected in the previous step from its background, go to Layer > New > Layer via Copy. This will create a new layer with just the selected area (the guitar player) as its content. A few areas on the guitar player need to be filled. 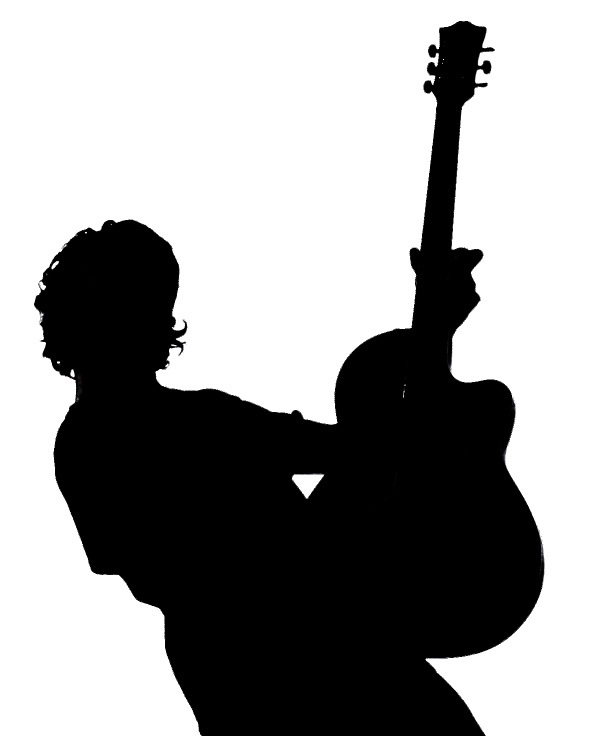 Go to Select > Load Selection and then fill the selected area with black again; this will get rid of some of the white spots within the guitar player. Create a new document (File > New) with the dimensions of 1200x1600px. 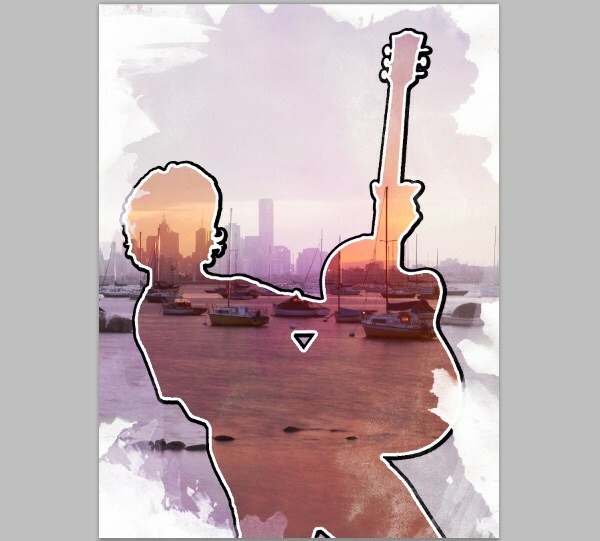 Copy and paste the guitar player layer into the new Photoshop document. 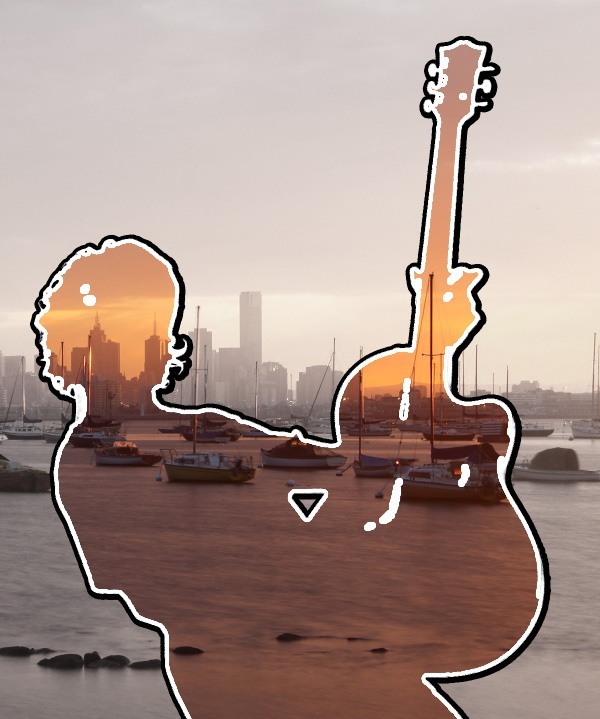 Next, grab our Williamstown image and bring it into our Photoshop document. Place it below the guitar player layer. Then we want to duplicate the background layer by going to Layer > Duplicate Layer. Move one of the background image layers above the guitar player, and then toggle off the visibility of the other background image layer temporarily so we can see our work better. 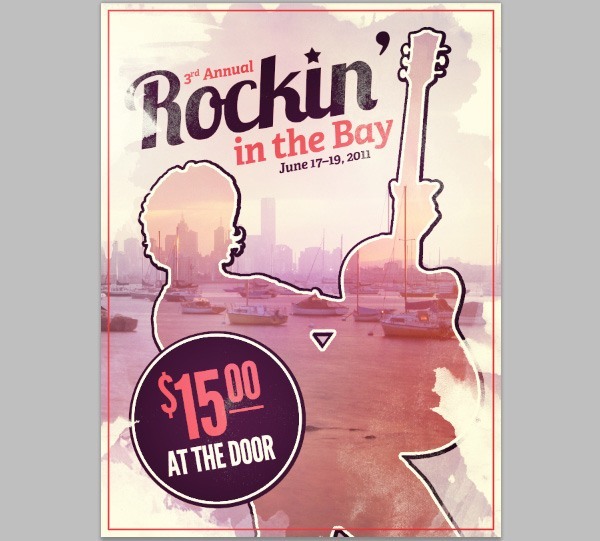 Click on the top background image layer in the Layers Panel to make it the active layer, and then go to Layer > Create Clipping Mask (Alt/Option + Ctrl/Cmd + G). 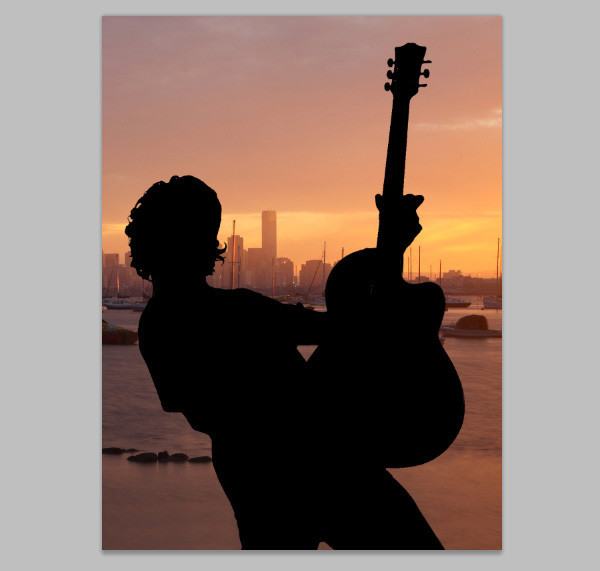 This will mask out all areas of the top background image that are outside of the guitar player. Toggle on the visibility of the bottom background image layer (the one that we temporarily hid). 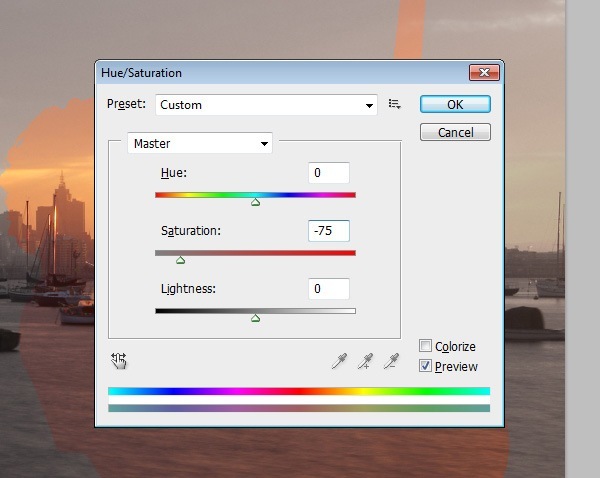 Click the bottom background image layer in the Layers Panel to make it the active layer then go to Image > Adjustments > Hue/Saturation. Change the Saturation option to -75. Next, go to Image > Adjustment > Curves and then lighten the bottom background image layer to give the two images more contrast. Go to Layer > Layer Style > Drop Shadow. 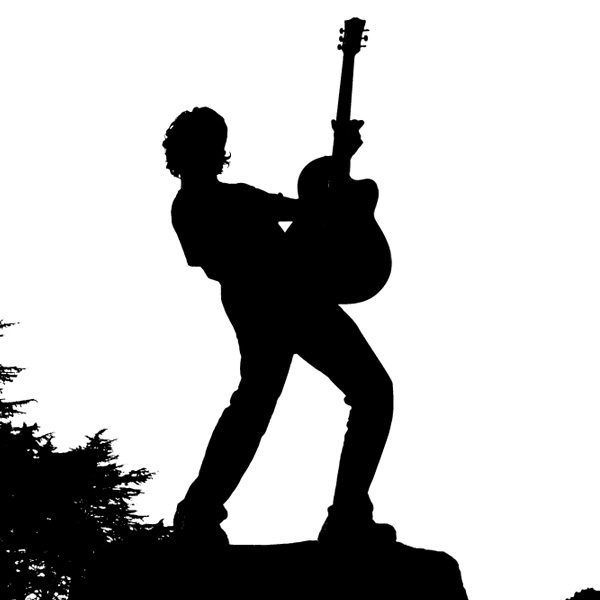 The layer effect above will give our guitar player an outer stroke/shadow. Next, go to Layer > Layer Style > Inner Shadow. This will give the guitar player an inner stroke. 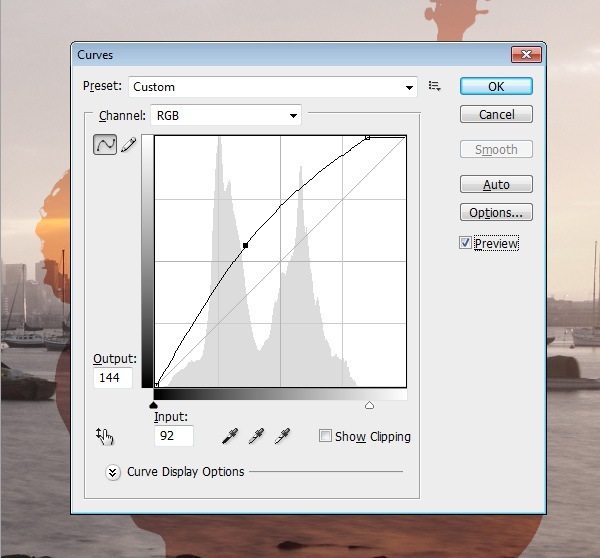 Tip: To learn more about layer styles, read Photoshop Layer Styles: Comprehensive Guide. You will notice that there are some weird white areas created by the white shadow from the previous step. 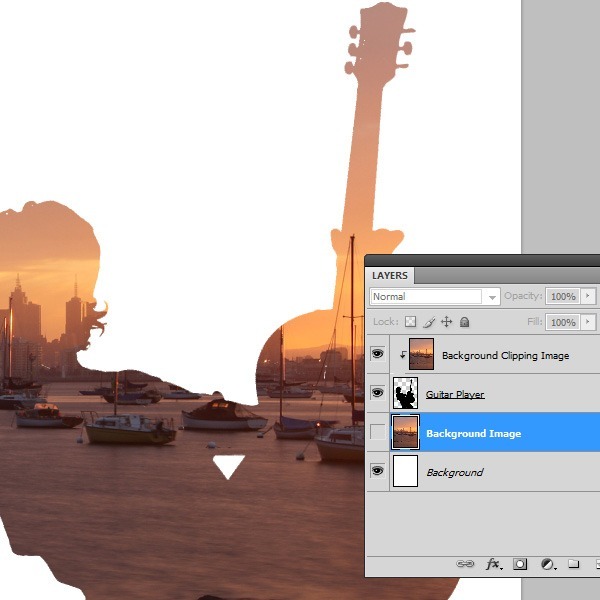 To get rid of the white spots, click on the guitar player layer in the Layers Panel to make it our active layer, switch to the Brush Tool (B) and, using a black brush with 100% Hardness, manually paint away the white areas. We are trying to achieve a lightly grungy look. 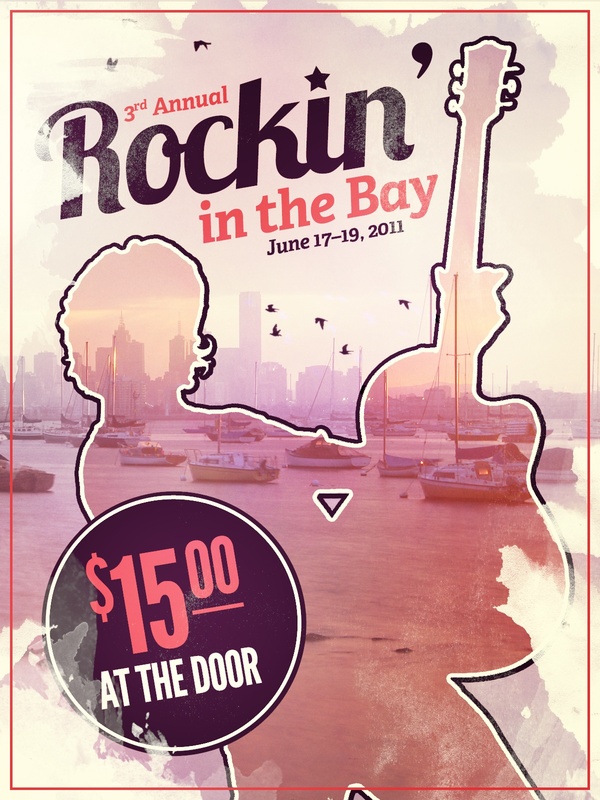 One of the ways to do this is to add a grungy edge around our poster. For this step, we are going to download and use the Watercolor 23 texture. Bring in the watercolor texture into our Photoshop document and then use Free Transform (Ctrl/Cmd + T) to scale it proportionally in such a way that the watercolor part of the texture covers most of the canvas. Now go to Select > Color Range, click on the outer white area to set it as a sampled color and then change the Fuzziness option to 55. This will make a selection of the white areas of the layer. Keep the selection active. Now create a new layer by going to Layer > New > Layer and, on this new layer, fill the selected area with white by going to Edit > Fill. This will make the outer edge white and give us a grungy border. 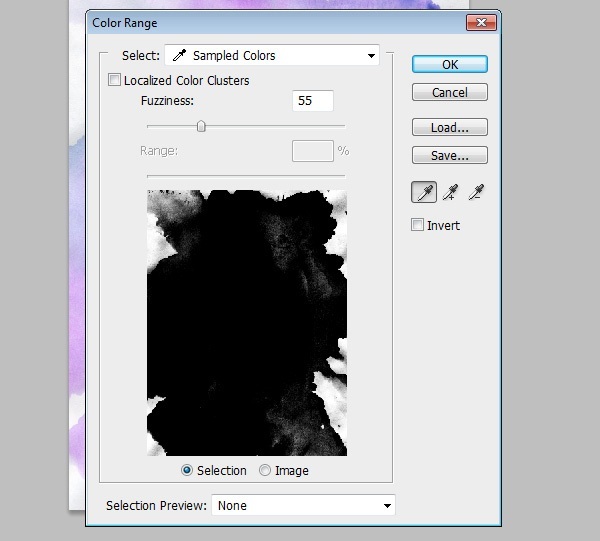 Change the watercolor layer’s Blend Mode to Overlay and Opacity to 50%. This simple tweak significantly alters our poster’s color. To add some depth to our outer grungy watercolor border, download and install this library of Free Hi-Res Watercolor Photoshop Brushes. 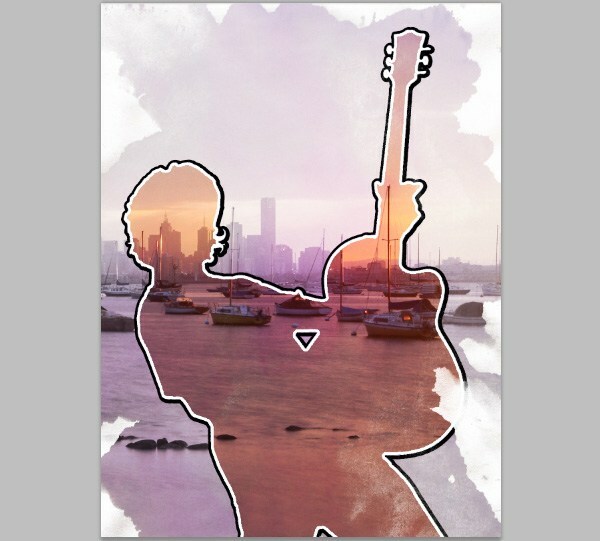 Create a new layer (Layer > New > Layer) just above the guitar and background image layers, but below the grungy watercolor border layer, for the brush strokes we will create in this step. Switch to the Brush Tool (B), set your Foreground color to white, choose a brush tip from the brush library we installed earlier in this step, and then paint in some watercolor strokes on the new layer. For the poster’s textual elements, we are going to use Adelle Basic for the "3rd Annual", "in the Bay", and the date, and Lobster will be used for the word "Rockin’". The red color is #e61c23, but you can use any shade of red you would like. 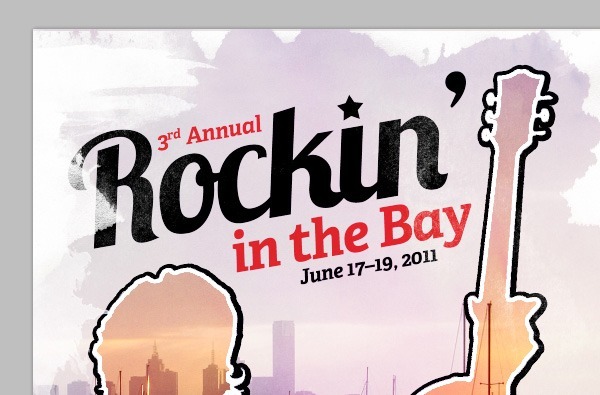 To get the star on the "i", click on the text layer and go to Layer > Layer Mask > Reveal All. On the layer mask, use a black brush to paint over the dot on the "i" to hide the dot. Switch over to the Custom Shape Tool (U), then in the Options Bar, click on the Shape dropdown menu, locate the 5 Point Star shape (it’s included with Photoshop by default) and then create the shape to replace the dot. We are going to add a little more color and lighting into our piece. Create a new layer just above the text layers, and using the red color (#e61c23) we used in the text, paint some spots of color using the Brush Tool (B) set at 0% Hardness and Master Diameter at 1100px on the new layer. You can also add spots that are more pink in color as well. Once done, change the Blend Mode of the layer to Soft Light. Click on the Ellipse Tool (U) in the Tools Panel, hold down Shift, and then draw a circle at the bottom-left of the canvas. 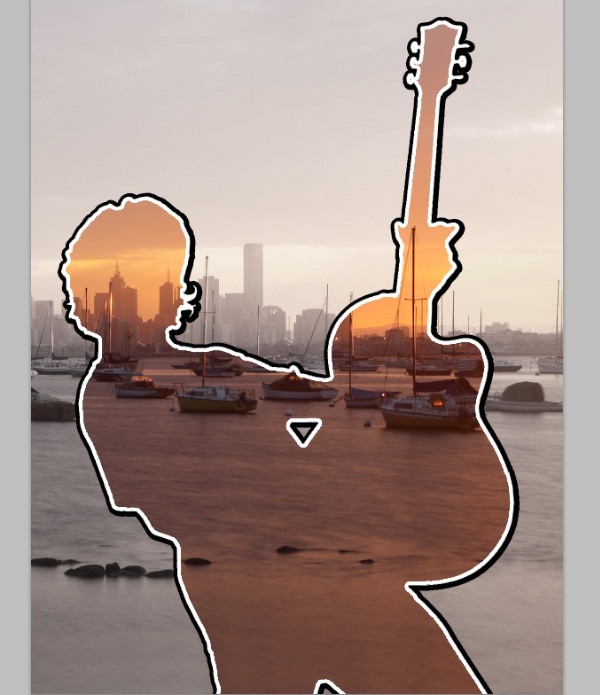 In the Layers Panel, right-click/Control-click on the guitar player layer and then choose Copy Layer Style from the menu that appears. Right-click/Control-click on the circle shape layer that we have just created, and then choose Paste Layer Style from the menu that appears. 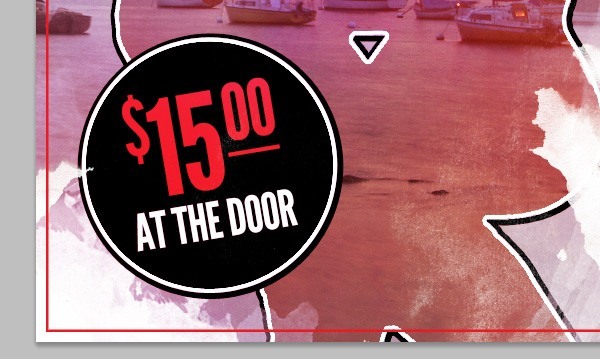 Use the Horizontal Type Tool (T) to place the price text inside of this circle. Use our red color (#e61c23) and white for the text. You can change the text’s angle using Free Transform (Ctrl/Cmd + T). You can add an underline using the Line Tool (U). We are going to place a red border around the poster, about 20px from the edges of the canvas. First, choose the Rectangular Marquee Tool (M), and, in the Options Bar, click on the Style dropdown menu and change it to Fixed Size as well as set the Width to 1160px and Height to 1560px. This will give us -40 pixels of the height and width of the canvas, resulting in a margin of 20px on each side. Click the Rectangular Marquee Tool on the top-left corner of the canvas, then hold down Shift and press the Down Arrow and Right Arrow key twice. This will move the selection 20px down and 20px right, putting the selection exactly at the middle of the canvas. Now go to Layer > Layer Style > Stroke, change the Stroke color to our red color (#e61c23) and then press OK to apply the layer style. We are going to give the image a little bit more lighting by going to Layer > New Adjustment Layer > Gradient Map. The Gradient Map should be the topmost layer. 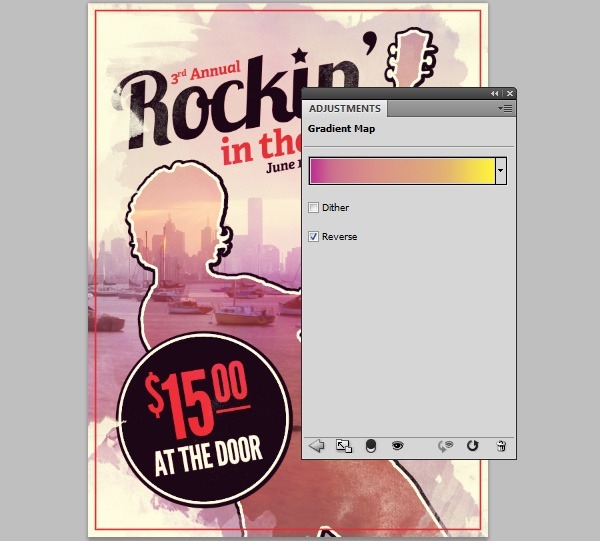 In the Adjustments Panel, change the gradient so that it goes from purple to yellow. 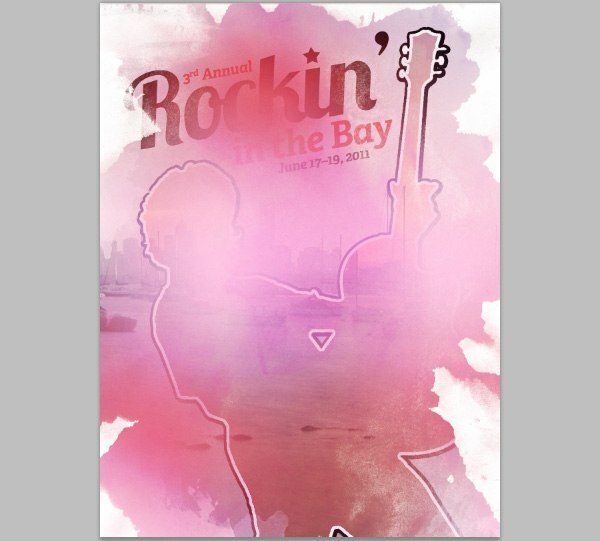 Afterwards, change the Gradient Map layer Opacity to 15%. Like we did in Step 13, we are going to use the Brush Tool (B) on a new layer to make a couple more spots of color, but this time, we are going to use white. After creating the white spots, Change the layer’s Blend Mode to Soft Light. This is the last step. We are going to add some birds flying around our text. Download and install this library of High-res Bird Brushes. Create a new layer for the birds. Use the Brush Tool (B) to paint the groups of birds. Next, go to Layer > Layer Mask > Reveal All, switch to a normal brush tip, and using black as your Foreground color, paint away some of the birds. In this tutorial, we used Photoshop to create a grungy but vividly colorful music poster. We used simple Photoshop features and techniques such as layer styles, layer masking, adjustment layers, etc. in conjunction with freely available graphics resources to come up with a beautiful final result. We hope you enjoyed this tutorial, and if you followed along, post a link of your own final result in the comments below!